Daniel Root: Those click-bait articles in your feed? They started in 1926. Those click-bait articles in your feed? They started in 1926. At first it was a trickle. "Lose weight with this one crazy trick" appeared every so often. Maybe a "Three tips for saving money on your XYZ" here and there. But now? Now it's everywhere. Now, it seems, everywhere you turn you "won't believe what happened next" or find something that "will blow your mind." A glance at my CNN newsfeed shows that the infection has spread to mainstream news as well. Breaking just today: "Humpback Whales did THIS to Boaters". Shoot, I'm guilty of it myself. Like it or not, in the increasingly noisy world of the internet, titles like this stand out. Websites routinely test and hone in on the titles that grab the most attention. Increasingly powerful analytic tools have made it possible to drill into exactly which titles generate the most traffic and revenue. What you may not know, however, is that this technique is nothing new. The man credited with first applying the formula to marketing died at the age of 90 - in 1990. 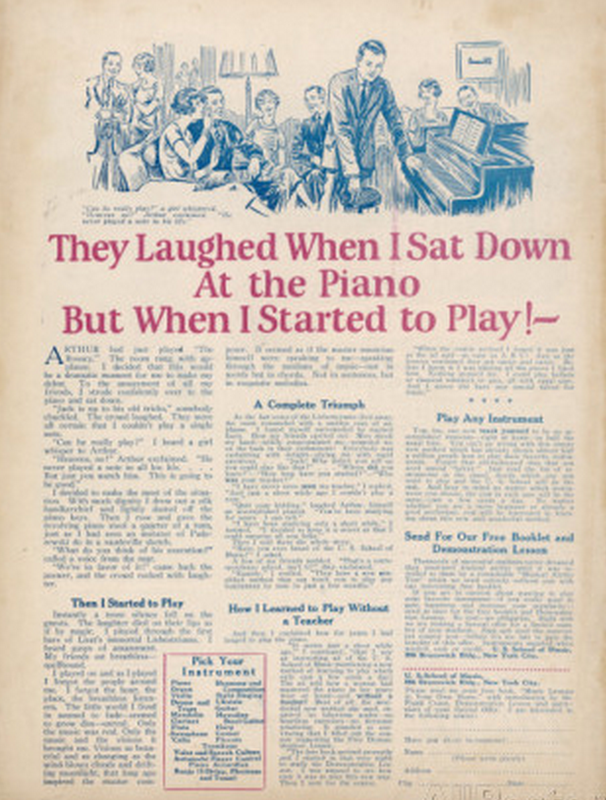 The ad he created carried the headline "They Laughed When I Sat Down at the Piano. But When I Started to Play..." Seriously, what cold-hearted soul could read that and not want to immediately buy piano lessons? I'm no marketing expert, but I personally think this trend is about to fizzle. Like anything, once it reaches a certain volume, people start to tune out. You'll never believe what trend will be next.